Hi I’m Hazel and this site is my digital journal. I write about motherhood, food, and crafts that I love. Browse around and leave your thoughts. and resources for the Filipina working mom. Sunday dinners are consistently when I most feel the cultural dissimilarity between my husband and me. Of course, a Filipina and an Englishman have greater cultural variance in many other areas than at the dinner table, but hey, food occupies about 70% of my waking thoughts, so. You see, Sunday dinners are when I try and make food that pleases everyone in the family. Growing up, Sundays were when my mother would cook dishes that I now consider comfort food. Her repertoire included hinatukan nga masag (crabs in coconut milk), sinugba (grilled pork or fish), linaga (beef or pork cubes slow-cooked in its broth), miniswahan nga pasayan (prawn soup with misua noodles), adobo, and bistek tagalog (braised beef steak), among other things. Writing all that just made my mouth water! I'm pretty sure my mother's Sunday cooking is why I try to make Sunday dinners at my household a bit different from our usual weekday fare. We were brought up eating mainly fish, rice, and vegetables on weekdays, so my mom's Sunday lunches shone as markedly special. And all those dishes were, quite naturally, eaten with the ubiquitous steamed rice. Always. Rice. On the other hand, my husband likes Sunday roast dinners. That he likes it doesn't mean he demands it; but what it does mean is that potatoes, usually mashed, is part of a meal he considers comforting. There are no volumes to speak of when it comes to my ability to cook him roast, but we do try every couple of months. We do the mash, at minimum. So, it is not uncommon to see pork adobo alongside a plate of rice and a bowl of mash at our Sunday dinner table. Eventually, two dinner plates became Team Rice and three became Team Mash. I thought I could influence all of our youngest child's food preferences and make the teams balanced, three to three, but I guess there are things one is simply born with. Every week, we make a batch of poached chicken for my son's meals. 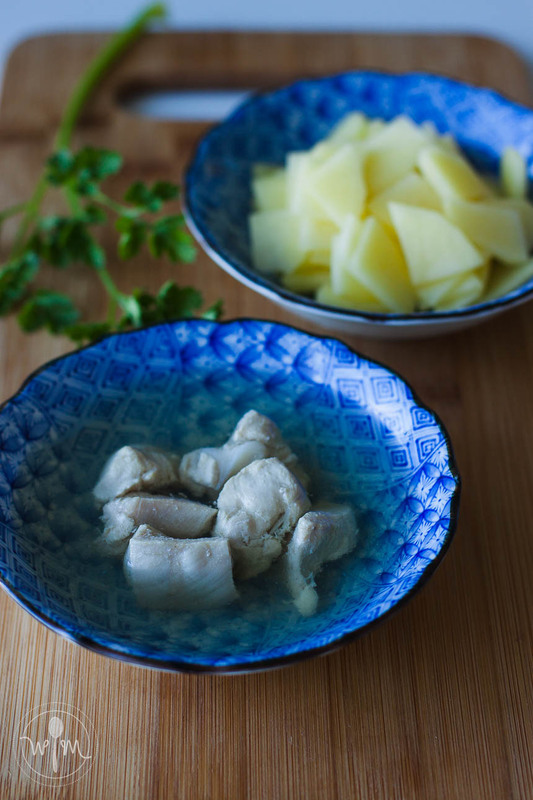 It's a simple preparation of cubed chicken breast fillets poached in vegetable stock for about 15 minutes. We portion our cooked meat and broth into tubs, each containing enough for 2-3 meals. The remaining broth, excellent as cooking liquid, is also frozen. For purposes of food safety, I prefer that we use what portions are thawed. So when we take one tub out, we cook multiple meals with it, serve one immediately and refrigerate the other portions. We just make sure that we feed it all to baby within 48 hours. For three 3-cm cubes of chicken, we use one medium potato and slice it into thin 3-cm squares. The chicken pieces are chopped or flaked and then set aside, along with some chopped parsley. In a saucepan, using some of the broth from poaching, we cook the potato slices until they break apart easily with a gentle prod of a fork. When nearly cooked, we add the chicken bits and parsley to heat them until the potatoes are done. The mixture needs to be cooled a little before puréeing, as hot liquid may sputter and cause scalding. Always cool the puree before feeding to baby or storing in the fridge. Printable recipe can be found at the bottom. Hope your baby likes this! Flake or chop the chicken pieces, set aside. Place potatoes, chicken broth and water in a saucepan and bring to the boil. Lower the heat and continue to cook until potatoes are done. Test by gently prodding the pieces with a fork, if you've sliced thinly, they should break up pretty easily for puréeing after about 15 minutes of cooking. When the potatoes are nearly done, toss in the chopped chicken and parsley into the saucepan. Once potatoes are cooked, remove from heat and cool slightly before transferring to a blender or food processor. Purée to desired consistency. Spoon single servings into food-safe tubs and cool before refrigerating. Feed to baby within 48 hours. The proportions here are just a guide, you can certainly adjust as you wish, like add more potatoes or other vegetables.